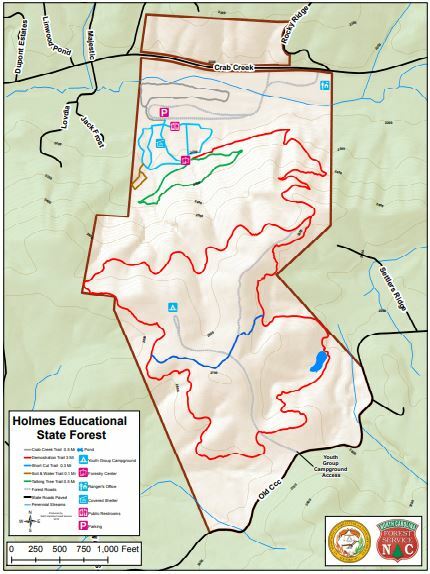 Whether you're looking for a strenuous hike, an educational stroll, a night under the stars, or just a picnic lunch with the kids, Holmes has something to offer you. Call us at 828-692-0100 to make picnic shelter, group campground (Youth Only) and program reservations. All services and facilities are free of charge. Crab Creek Trail is a short, gravel trail that follows Crab Creek through the remains of what was once a small tree nursery then past the forest’s Pollinator Garden and Labyrinth. Soil and Water Trail is sponsored by the Soil and Water Conservation Districts of Henderson, Transylvania, and Buncombe counties. Wooden boardwalks and stairs take you through a diverse forest aquatic ecosystem. Points of Interest – Wetland plants and wildlife. Talking Tree Trail is our most popular trail that takes you past 7 “talking trees” and through a rich cove forest where you will see many species of plants and wildlife. Points of Interest – Talking Tree information stations. Forest Demonstration Trail is our longest trail that will take you from the bottom of the forest to the top. Elevation gain is around 500 feet. Points of Interest – Forest management exhibits, small pond, observation deck. Short Cut Trail connects the two sides of the Demonstration Trail essentially cutting the distance of the Demonstration Trail in half. Points of Interest – Observe plants and wildlife as you traverse different habitat types.